Rejected For Google For Nonprofits? Here’s Why. The reasons behind each applicant’s denial are slightly different but suffice to say not all nonprofit organizations are eligible for the Google for Nonprofits program. Organizations must be recognized by the IRS as tax-exempt 501(c)(3) organizations formed for charitable, educational, religious, literary, scientific, or other tax-exempt purposes. For more information, see How to Apply for Charity Status. School, childcare center, academic institution, or university (philanthropic arms of educational organizations are eligible). To learn more about Google’s programs for educational institutions, visit Google for Education. Over the years of managing Ad Grant accounts, here are the top 3 reasons why I’ve seen nonprofits denied for the Google For Nonprofits program when they thought they were eligible. The organization is a new nonprofit and although it may be listed in the IRS database it has not yet been updated over into the GuideStar database. They do not have a website set up or it is listed as under construction. Their NTEE category codes incorrectly lists them under an ineligible category such as a hospital. Reach out to us here at Kinsey Street and we will be glad to assist. If you are a 501(C)(3) that has not registered for Google For Nonprofits yet and you believe your organization is eligible, I highly recommend that you take the steps to register today. It is a great program that Google provides for nonprofits and if you need help, simply give us a call at 425-405-0690 and we will help guide you through the process free of charge. A user in the Google Ad Grants Help Forum where I am the moderator (or what Google calls a ‘Top Contributor’) commented on the number of posts they had seen lately about denials for GrantsPro applications and asked if there was anything they should be doing to improve their chances of getting accepted. Before I share my response to the question, let me tell you a little about GrantsPro for those that are not familiar with the program: GrantsPro is part of the Google Ad Grants program and offers nonprofit grantees an increased ad spend of $40,000 USD per month instead of the standard (and already extremely generous) $10,000 USD per month in free advertising on Google AdWords. Have conversion tracking installed and be successfully tracking at least one conversion. The conversion cannot simply be a page view of your homepage, but be tracking a substantial action such as a newsletter or volunteer sign-up. Have hit your monthly budget cap (at least $9900) for at least two different months over the last six months (they don’t need to be consecutive months). Have maintained an average account level clickthrough-rate (CTR) of 1% or higher over the past 6 month period. Submit the online application detailing how you will use the increased advertising grant money. Be in good standing with the Google Ad Grants program and abide by our program policies and guidelines. Have an authorized representative of the organization who manages the account at minimum on a bi-weekly basis. Complete an annual survey and agree to share impact or conversion data. As such, not all applications are approved for Grantspro status but applicants can improve their odds for acceptance if they understand some of the aspects that can make an Ad Grants account a successful candidate for Grantspro beyond the minimum requirements. Mission based keywords and ads – the ad spend needs to be for relevant traffic. If your current account is generating what I call “fluff” traffic and not relevant traffic, then you likely will not be approved. Your current grant budget should be spent wisely and it should be spent on keywords that generate traffic that can help your nonprofit achieve its mission. REAL conversions – the nonprofit organization really needs to be making an impact with the current grant. Lite conversions, such as tracking a page view is not necessarily an indication of the organization using the grant to make an impact. The tracked conversions should show tangible benefit that the Ad Grant has brought to your nonprofit organization. Also, make sure that these conversions are tracking within the AdWords interface. Just tracking within Google Analytics is not enough – however, analytics IS important. Give it time – Don’t apply after just 3 months, have some time in the regular Ad Grants program first. Give it at-least 6 months before applying, even if you have hit full ad spend for 5 months. I’ve seen this over in the Ad Grants Help Forum quite often, where it is a brand new account and they were blessed with being able to target keywords with heavy search volume and after 3 months they are trying to apply for GrantsPro. In most cases, they are not going to be approved. so give it a full 6 months before applying. Oh, and for the record, full daily ad spend in the month of February will never equal $9900 so if you are including February as one of your 2 months to hit budget cap, your application will be rejected. Active account management – Make sure the account is being managed on a consistent basis. Simply put, it active account management is one of the core policies of the Google Ad Grants program. If you do not have the time to actively manage your Google Ad Grant, then hire an agency such as Kinsey Street to do it for you. Go beyond active management – The Ad Grants account should be optimized and follow AdWords best practices. Just because the account is spending the full budget and just because someone touches the account does NOT mean that the account is properly optimized. However, if you are following tips 1-4 above then #5 pretty much falls into place. Really take time to fill out the application and to write a well-thought out responses to the questions on the application. Google is offering to give you an ADDITIONAL $30,000 USD per month so do not treat the application as just another 5-minute form you need to fill out. Give the application it’s due attention and be able to clearly articulate how Google Ad Grants has impacted your organization so far. 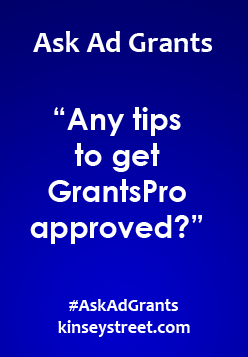 Because, if you cannot answer the question, “how has Google Ad Grants impacted your organization so far?” then you are not ready to apply for GrantsPro. If you have a Google Ad Grant account that you feel could be achieving more and maybe even qualify for GrantsPro status with some expert management, then feel free to reach out to us and lets discuss your account. 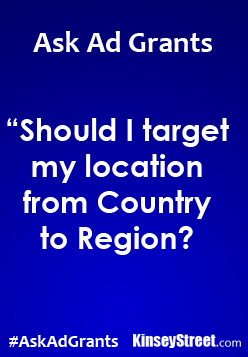 Ask Ad Grants – Should I target my location from Country to Region? As the Top Contributor of the Google Ad Grants Help Forum in the AdWords Community, I am often asked about maximizing ad spend of the Google Ad Grant to generate more clicks. Many grantees run into an issue with being able to gain much traction due to the $2 bid cap imposed on Grant accounts and this grantee was wanting to know if changing the location targeting would help overcome some of these challenges. With Google Grants I want to get as many clicks as I can because the $2.00 cap on keywords makes it hard for me to get clicks. Would I have more luck if I limited my location from Canada to Ontario (a Province within Canada that my site targets)? I have experimented with this but haven’t seen a difference. Regardless of ad spend, it is best to target the location that is MOST relevant for your organization to reach the audience that is RIGHT for your organization. Expanding your targeting to reach a broader audience that is not relevant to your organization may let you spend more of your budget but it will be wasted budget and your account will end-up degrading over time which will make it much more difficult to target the right audience in the future. If you are having a hard time being competitive at the $2 bid cap, then take a serious look at your quality scores and work to improve them. The main way to do this is to ensure that your account is well segmented with ad groups that are tightly themed. This will allow you to craft ads that are more relevant and likely to generate higher click through rates (CTR), which will in-turn increase your quality scores and will lower the high top-page bid estimates you are likely seeing. Over all, do not worry too much about the number of clicks or the budget spent – instead, focus on being relevant with your ads, reaching the right audience and generating conversions. Your main goal should be to use the Ad Grant to help your organization accomplish its mission, not to generate as many clicks as you can. If you have a question on Google Ad Grants, feel free to reach out to me. I will be glad to help. Last week I had mentioned the big news that Google For Nonprofits was now in 5 countries but did you know that one of Google For Nonprofits most popular products, Google Ad Grants – Google’s nonprofit version of Google AdWords that provides up to $10k/month of free advertising on Google AdWords is already in 41 countries! If you haven’t signed your organization up for Google Ad Grants yet, why not? 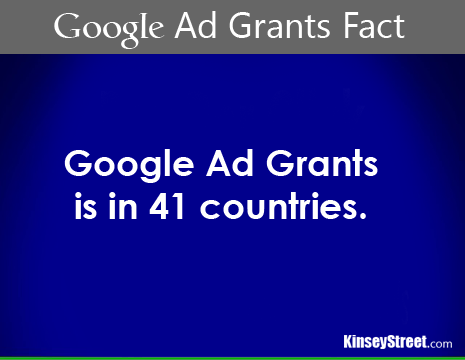 Here at Kinsey Street, we are Google Ad Grants experts and have clients in multiple countries. and provide ongoing management of your Google Ad Grant for you to ensure that you get the most benefit out of this fantastic program. Google For Nonprofits is is now available in 5 countries! Google Apps For Nonprofits – Get free access to the Google Apps suite including Gmail, Google Calendar and Google Drive. YouTube Nonprofit Program – an enriched version of YouTube just for nonprofits that let’s you place a Call-To-Action overlay directly on your videos. Google Earth Outreach – Tell your organization’s story through a custom map of showing your projects sites and their impact. and our personal favorite, Google Ad Grants – Promote your organization’s website with up to $40,0000 in free AdWords advertising. If your nonprofit has not signed up to this wonderful program yet, we highly encourage you to do so. If you need help, just ask. This last week I was honored to be invited by Google to speak on a panel with 4 other agency owners at this year’s Google All Stars Summit at Google’s headquarters in Mountain View, CA. The exclusive event hosted about 200 Google Partner agencies and the panel fielded a range of questions on running a successful agency from moderator, Jennifer Qiao of Google and from the audience. The All Star Summit was held at the Googleplex, Google’s home-office in Mountain View, CA and in addition to the Agency Speaker panel, attendees also got to hear from other Google experts and from Google product managers form AdWords, Analytics, Shopping and the Google Partners program. Google announced today that it was launching it’s popular Google For Nonprofits program in Canada. This extends the program that first launched in the US to its 3rd global region. The much loved GrantsPro program is back! The program had a soft-launch back on Thursday May 29th but we are officially allowed to discuss it now so here are the details. The GrantsPro program is an extension on the standard Ad Grants program from Google that increases the current $10,000 per month in free AdWords advertising an additional $30,000 per month, for a total of $40,000 per month in free AdWords advertising. Suffice to say, a nonprofit can do a lot of good with that kind of AdWords advertising budget. But to get to the GrantsPro level, you really need to be doing good with the existing $10,000 per month Ad Grant first. Have installed conversion tracking and be successfully tracking at least one conversion. The conversion cannot simply be a page view of your homepage, but be tracking a substantial action such as a newsletter or volunteer sign-up. Have effectively spent the standard Google Ad Grants monthly budget (at least $9900) for at least two different months over the last six months (the two months do not need to be consecutive). Maintained an account level clickthrough-rate (CTR) of 1% or higher over the past 6 month period. Submit an online application detailing how you will use the increased advertising grant money. Have a dedicated member of the organization who manages the account at minimum on a weekly or bi-weekly basis. Must complete an annual survey and agree to share impact or conversion data. You must have and maintain an account-level clickthrough-rate (CTR) of 1%. This is to ensure that Grantspro recipients are effectively using their free advertising grant money. You’ll need a dedicated member of the organization who manages the account at minimum on a bi-weekly basis. Standard Ad Grantees must sign in at least once a month to abide by our Active Account Management policy, but Grantspro recipients are required to demonstrate more engagement with their account. All GrantsPro accounts will be subject to review on a quarterly basis. If an account doesn’t continue to meet the GrantsPro eligibility requirements, the account may be subject to having its budget decreased to the standard Google Ad Grants spend limit of $10,000 per month. These new requirements also apply to existing GrantsPro accounts and emails have gone out notifying grantees with existing GrantsPro accounts of these new requirements. List your top 3 goals for your organization. How has Google Ad Grants impacted your organization thus far? How will you spend the increased budget? Of special note, space is limited and Google may not be accepting every nonprofit who applies but it is great to have the GrantsPro program back. We’re hosting an exclusive Google event on May 21st, and you’re invited to join us. 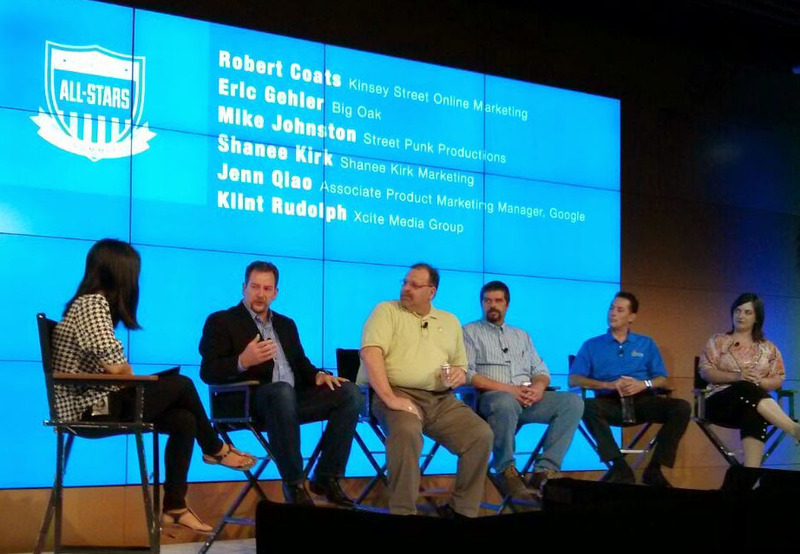 It’s a great opportunity to learn from Google experts about how to grow your business. We’ll provide refreshments, all we need is your company. Please RSVP as soon as possible. We’d love for you to come learn with us. Arjan, author of The Small Think Big Book, will share unique insights, inspirational stories, and actionable ideas to help small businesses thrive in a hyper-connected marketplace. Ben will discuss how small businesses should approach working with an agency, what resources the Google agency team provides, and the importance of working with an online professional. Could Google Glass help your nonprofit better achieve their mission? If so, here is a *GREAT* opportunity that you really need to check out.